Precision in Architecture and Design ! Voysey was an intense visionary. Like Ashbee he was a British architect and designer, with a specialism in typography. 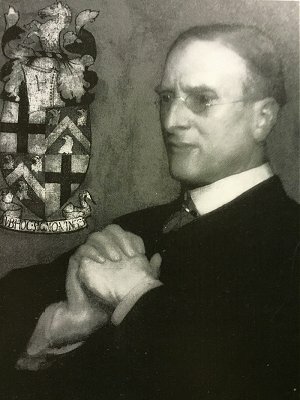 Beginning life in Kingston-Upon-Hull and educated at Dulwich College, Voysey had a slightly more religious upbringing than most, owed to his father Rev. Charles Voysey, founder of the Theistic Church. For three years, from 1874, C.F.A worked as a pupil in architectural training under J.P Seddon, before pursuing brief employment by George Devey. 1882 marked the year of his first independent venture, where he embarked on a career not so focused on architecture, but in the areas of decorative work, although working on flat-patterns was his most consistent of the media. His initial success was in the sale of fabric designs for wallpaper in 1883. Along with this, his first recorded furniture design was for the ‘Swan’ chair that same year, considered an ode to Pugin. This natural growth in his practicing saw him join the Art Worker’s Guild the following year, of which he became the Master of in 1924. It must be noted that his infallible character did not always make for easy business with clients. His precision reflected in the quality of his products, his body of work was done in the most effective manner necessary, to the extent that every text was hand-written and every last detail in his commissions were drawn by himself. But this didn’t leave for much flexibility, when so much structure is required in a single mindset; he was a very sure man. Before then of course, Voysey was commissioned to design a house in Bedford Park, for which he is widely acknowledged for. Titled ‘Grey House’, it was common of his contemporary style to build things to stand out, or alone. His influence on urban and suburban developments in the early 1900s was soon to exceed the sought after ‘Queen Anne’ design. In this age of design he contributed simplicity, the deception of simplicity, fixated linear work, with limited or no surface decoration. Voysey did not flirt with contemporary ideas, he allowed tastes and fashion to pass by unnoticed, and naturally campaigned against the ugliness in Modern society. By 1924, he was known on an international level, essentially for exhibiting in locations including; the Salons de la LibreEsthetique (1894 and 1897), Leige (1895) and Turin (1902); and for the featuring in written articles such as House Beautiful, Chicago (1896). The ‘Glasgow Four’ that Voysey had presented his artwork alongside in Leige, could not be considered apart of the Arts and Crafts Movement. However, the influence that Voysey had on young designer Mackintosh did help to pioneer and translate the idea of the movement into the Modern Movement, that of which came just after but for a short period ran parallel in time. It was the ethics related to the nature of craft that could be incorporated into their ideologies. The advantage held by the Glasgow School was their vast and valuable connections with ears over seas; the ideas of Morris and Ashbee were listened to very attentively on the Continent. Voysey and readers of Voysey have stated that he is considered more often as the heir to Pugin, rather than the founder of the Modern Movement. This is perhaps because he wasn’t so fond of it, despite falling in to it. Similar to Pugin, he was driven by the ‘overtly religious image of the artist’s role’; being symbolic, designing homes with the beauty of a temple, furniture so wonderful that they made the owner feel more than the ordinary person. The artist held in his hands the ability to create change, to alter ways of thinking and being through his work. Regarding the Modern Movement, ‘..this is false originality, the true originality having been, for all time, the spiritual something given to the development of traditional forms by the individual artist’. Voysey’s designs weren’t limited in their medium, as he produced for glass and pottery manufacturers too, Pilkington Tile and Pottery Co. Ltd. His work was often identified by the involvement and addition of hearts and doves, elegantly rounded shapes, with subtle gestures. These gentle features relate quite peacefully to nature, which again was a theme embedded in the build. Oak wood was used for the majority of his furniture; ‘the wood in its natural colour which every day grows more pleasant to look at’. This would suggest that the works didn’t just age, they would change and grow, with the times or weathers, and with the owners. They should look different in each room that they are placed, and they should look different as they stand and live through each new movement. His home too, ‘The Orchard’, in Chorleywood in Hertfordshire (1899), was also the home to nature. To a family, where in the turn of the century, change and growth was the only way.